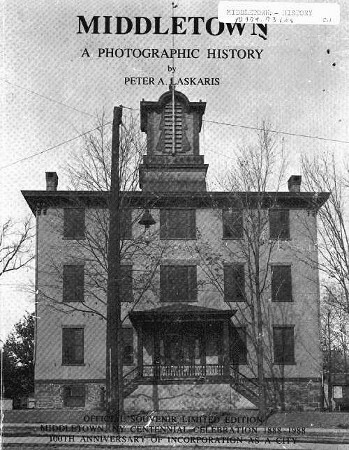 Peter A. Laskaris, a historian and member of the Historical Society of Middletown, has approved the digitization of his book, Middletown: A Photographic History for the education and enjoyment of students, library patrons, Middletown residents, and our online visitors. We at Middletown Thrall Library are grateful for this resource being made available to us. You may view the printed version of this rare, educational work by visiting the Reference Department or by contacting our Local History Librarian at (845) 341-5454 ext. 5479. To view the online edition, please follow this link or click/tap the book cover. You can now also search within this book. Please visit our Local History Department page to learn more about our Digital History Initiative as well as other texts and local history materials available at our website. The work was reproduced with the author's permission and may not be downloaded, stored electronically, sold, or redistributed without the author's written authorization. This work is protected under Title 17 of the United States Code and international intellectual property statutes and agreements. The copyright of this work remains with ts author, Peter A. Laskaris, and has not been released to the public domain.